Want a glimpse into the wonderful dishes the chefs are preparing? Scroll through this list and share your favorites! 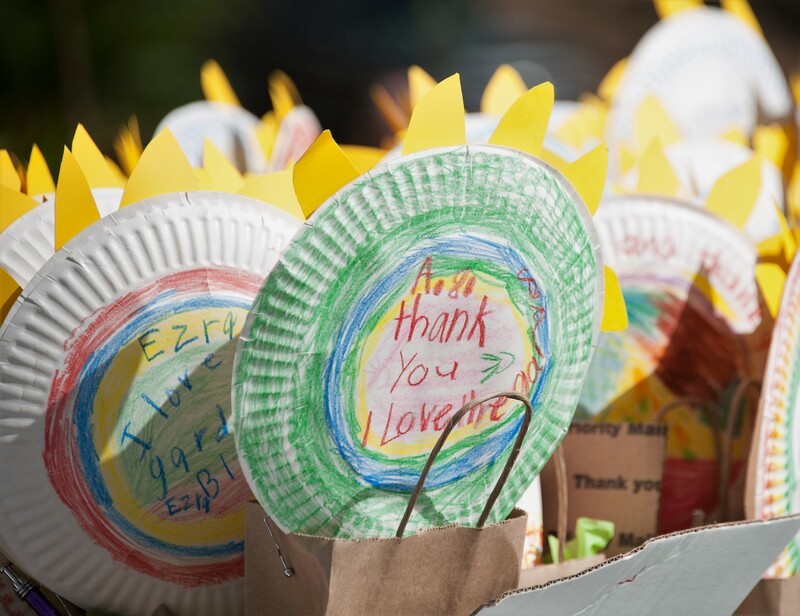 Grow Some Good cares deeply about our island environment, and it has long been a goal of ours to reduce the amount of waste generated at the annual Taste of School Gardens event. Through our partnership with the Maui Huliau Foundation Green Events program, and our event hosts at Maui Tropical Plantation, this year we hope to meet this goal and minimize the waste that goes to landfills. Maybe not completely, but we can get close! Zero-waste stations throughout the event will have separate receptacles for food waste and recyclable material, diverting 65-86% of waste from landfills. Each station has bins, educational signs and volunteers to ensure that items are disposed of properly. These waste stations become educational opportunities to share the importance of the tenants of reduce, reuse, and recycle, and demonstrate how simple it can be. The use of compostable serving dishes, forks, and spoons, generously donated by Sustainable Island Products, will help reduce waste further. As gardeners, we know the value of composting and creating rich, vibrant soil, and we’re excited about using compostable materials. We’re also encouraging guests to reuse their glassware, and providing rinse stations for glasses at the wine tents. Mahalo to our partners in creating a zero-waste event at this year’s Taste of School Gardens. Mahalo Nui Loa to Our Sponsors! Taste of School Gardens took place Saturday, March 10th at the Maui Tropical Plantation Grand View Lawn. We’re grateful to our event hosts, Maui Tropical Plantation, for providing this venue surrounded by lush farmland, and with a breathtaking view of the Waikapu Valley. 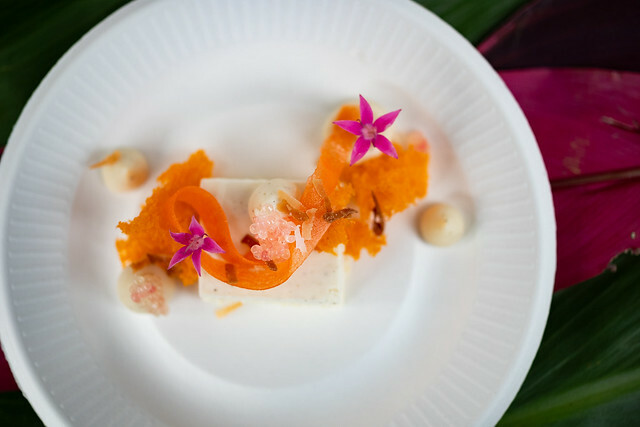 Some of Maui’s best chefs served up delicious dishes inspired by school gardens. Mahalo for your support! 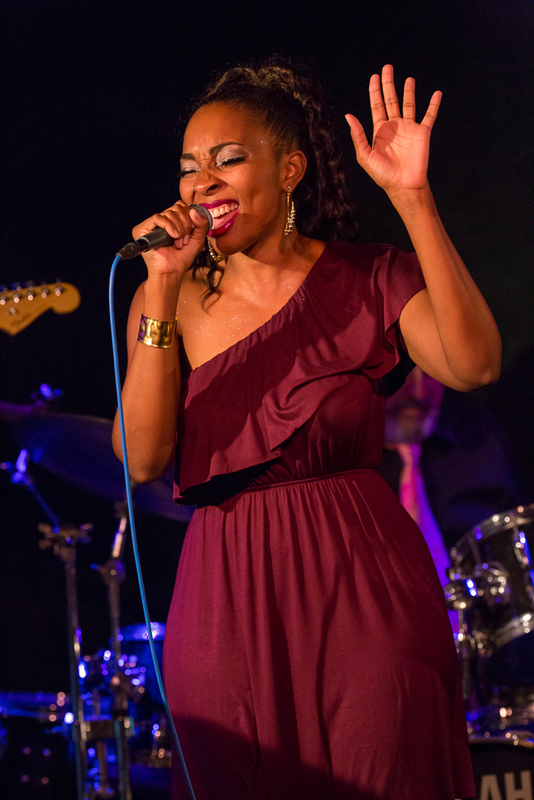 Mahalo to Maui singer Deborah Vial for sharing your great vocal talent at this event. Thank you to our sponsors for lending their support and expertise to make this event a success! Make your vehicle sparkle in time for the holidays! Get your car or truck washed and dried, and it will be looking good for all of those holiday activities and events coming up. Your car wash donation supports Grow Some Good’s school garden programs in 12 Maui schools, with 4,500 students participating each year. These programs teach students how to build healthy soil, work with natural life cycles, learn STEM principles, and grow their own food. Through school gardens, Grow Some Good helps create a healthy community, support local agriculture, and improve access to nutritious, affordable food. The car washes are sponsored by Ohana Fuels’ ‘Fuel Up. Do Good’ community giving program. From October 1st through December 31st, Ohana Fuels will generously donate a portion of all fuel sales from their Maui gas stations to Grow Some Good. Car washes will be held on December 2nd and December 9th. Cost is $10 per car. What a bargain! Get yours today. Tickets purchased online may be redeemed either day. Tickets are also available at the event. Tickets are non-refundable. Thank you for supporting our school garden programs! Grow Some Good will be the beneficiary of Ohana Fuels ‘Fuel Up. Do Good.’ program for the fourth quarter of 2017. From October 1st through December 31st, Ohana Fuels will generously donate a portion of all gasoline sales from their Maui gas stations to the organization. “Through this donation we can teach science, math, history, art and culture in our gardens, inspiring the next generation of farmers, chefs, teachers and scientists on Maui. With strong roots in our community, Ohana Fuels understands the importance of preparing our keiki to be future leaders. We’re excited to have the support of Ohana Fuels,” said Kathy Becklin, Executive Director of Grow Some Good. Ohana Fuels has eight locations on Maui, in Makawao, Pukalani, Lahaina, Kihei, Wailuku and Kahului. Certified as a TOP TIERTM fuel provider, Ohana Fuels meets the premier standard of gasoline for optimum performance and fuel efficiency. Stop by one of their stations to Fuel Up. Do Good. And support Grow Some Good! Mahalo to Ohana Fuels for your support! Keiki farmers at Kamalii Elementary School and Kihei Elementary School enjoyed a fun Harvest Festival at each of their schools. 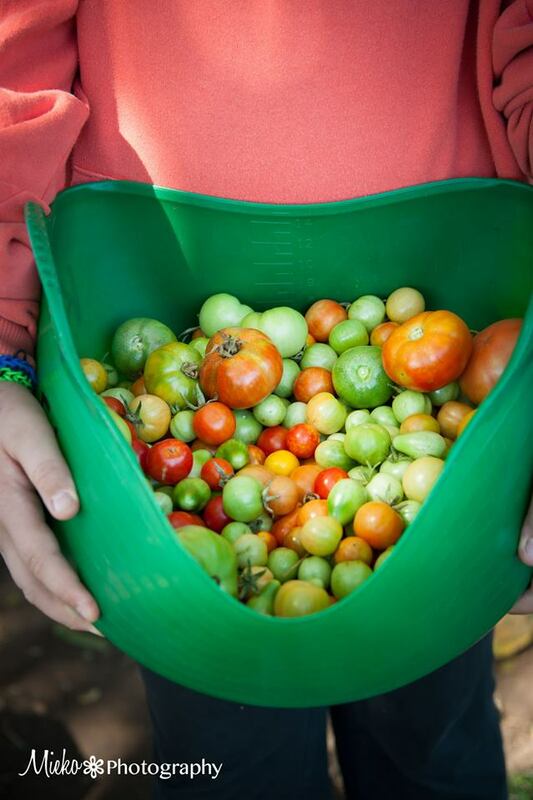 These annual events are a highlight of the school garden program, as students make and enjoy healthy snacks with fresh produce, from recipes designed to be simple, so they can be easily duplicated at home. Chef Kevin Laut from Outrigger Pizza Company brought his portable pizza oven to Kamalii Elementary School to cook up some quick pies with the assistance of Makena Golf & Beach Club’s Executive Chef Chris Kulis. See more pictures on the Makena Golf & Beach blog. Outrigger Pizza Company Chef Kevin Laut assists in preparing the pizzas. PC: Matthew Thayer, the Maui News. Makena Golf & Beach Resort Executive Chef Chris Kulis helps with spreading pizza sause. PC: Makena Golf & Beach Club. Chefs and keiki enjoyed a wonderful morning making pizza and fresh-squeezed lemonade. PC: Makena Golf & Beach Club. At Kihei Elementary School, Chef Travis Morrin from Fork & Salad and Three’s Bar & Grill came by to assist students with making tortilla-veggie pizzas on the grill. 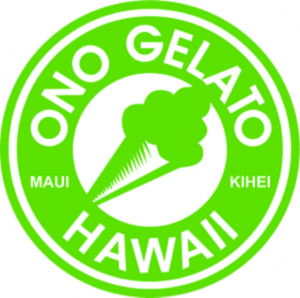 The results were ono-licious! See Chef Travis’ fun interview with the keiki. Chef Travis Morrin PC: Kiaora Bohlool. Kihei Elementary School kids enjoy the product of their work – veggie pizzas! Chef Travis Morrin and Garden Coordinator Nadine Rasmussen. Thank you to the wonderful chefs who made time to come our to visit with our students! And thank you to The Maui News for this front-page piece! The Taste of School Gardens theme “Growing, Knowing, Sharing” showcased Grow Some Good’s programs as guests enjoyed fresh produce, grown in educational outdoor classrooms and local farms, prepared and shared by some of Maui’s best Chefs. The event raised just over $58,000, with 325 attendees coming out to support Grow Some Good. It was a magical night – one where the delicious rewards of our school gardens were featured in the very dishes our guests enjoyed! Taste of School Gardens demonstrates the heart of Grow Some Good’s programs – where outdoor classrooms, nutritious food and Maui’s finest chefs converge. One of the special features at the event is the outdoor classroom area. Here, our garden educators share real lessons used in the gardens and showcase students’ work. See more Taste of School Gardens photos on our Facebook page. 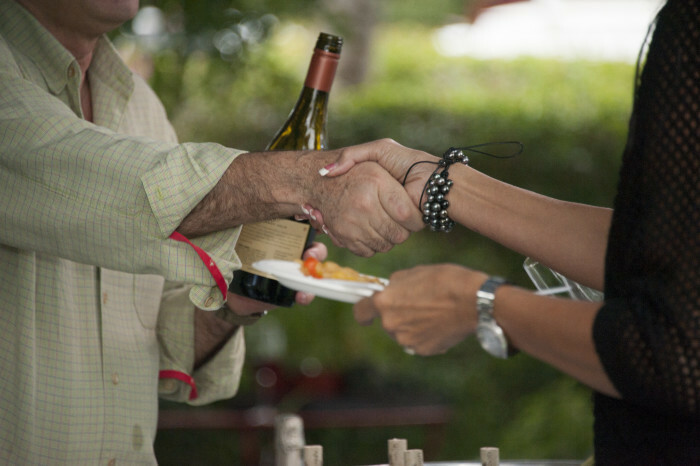 The event is the culmination of a season of fundraising events hosted by our participating restaurants. Our Dinner Series features special events, dinners, and even specific dishes that raise funds for Grow Some Good throughout the year. Participating restaurants showcase their favorite garden-inspired dishes at the ultimate event – Taste of School Gardens. To sign up for the Dinner Series add your name to our email list. MauiNow video journalist Kaiora Bohlool covered the event and shares her insights in the video clip: Kids Inspire Cuisine at Taste of School Gardens. Taste of School Gardens Menu Announced! Announcing the Taste of School Gardens Menu! This week Chefs unveiled their special garden-inspired dishes for the Taste of School Gardens event on March 4th. Feast your eyes on these mouth-watering gourmet items! Chef Peleg Miron of Spago (at left) will serve Fresh Catch Sashimi with fragrant Thai Herbs and Green Papaya Salad. Chef Zach Sato of The Restaurant at Hotel Wailea, will serve Shrimp Poisson Cru on a Rice Cracker and Slow Cooked Baby Carrots with Tempura Watercress and Lemongrass. Chef Craig Dryhurst of DUO at Four Seasons Resort Maui at Wailea, will prepare Aquerello Risotto cooked in Tomato Consommé with Chives, Walnut and Beet Lace and for dessert, Orange & Vanilla Poached Carrot “eclair,” with a Grand Marnier Cloud. Chefs Jaron Blosser, Cody Christopher and Travis Morrin of Three’s Bar & Grill and Fork & Salad, are serving Peas n Carrots made with roasted Oko’a farms organic carrots, pea shoots, macadamia nut pesto, wasabi peas, goat cheese, culinary garden soil and Ni’ihau Lamb and Vegetable Chili made with ground local lamb, kabocha squash, corn, keiki grown vegetables, tomato, cheddar cheese, and sourdough focaccia. Nicol Bradley of Ono Gelato Creamery and Shack Café will share Cruncher Ruebens made with Pastrami and Swiss with Green-Apple Horseradish Slaw on a Fresh Baked Rye Kaiser Roll with House-made Mustard and 1000-Island Dressing, Rata-tat Garlic-Chive Goat Cheese with Macadamia Nut Pesto Grilled Veggies, Tomato Salad and Kale Slaw on a Fresh Baked Mustard Hoagie Roll with House-made Mustard and Meyer Lemon Aioli, and a Banana Split made with Chocolate, Vanilla and Strawberry Swirled Gelato with Sliced Bananas, topped with Strawberry, Pineapple and Chocolate Fudge Sauces, finished with Whipped Cream, Macadamia Nuts & a House-Baked Cherry Topped Coconut Macaroon. 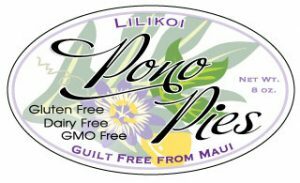 Chef John Cadman, owner of Maui Breadfuit Company and maker of Pono Pies will serve an assortment of delicious ulu (breadfruit) pies, in a variety of flavors, including chocolate, mango and lilikoi. 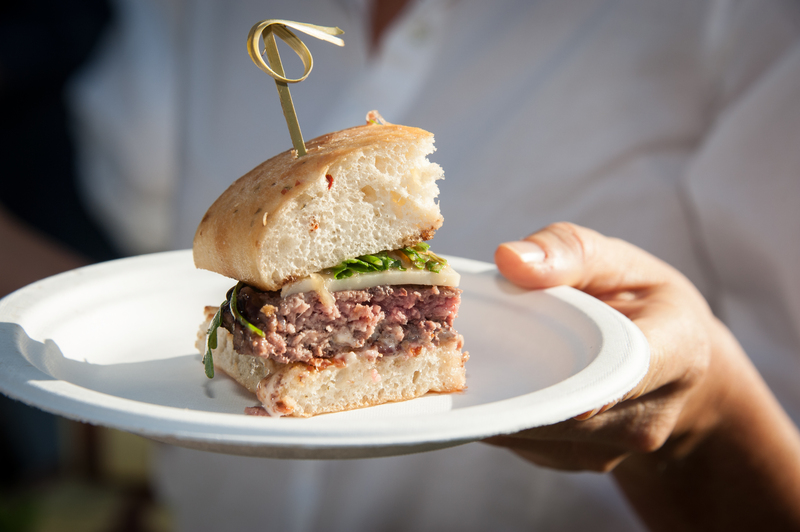 Chef Roger Stettler with Cow Pig Bun, will serve the House Burger: made with a Grilled Beef Patty, Focaccia bread, Roasted Garlic Bacon Aioli, Gruyere Cheese, Arugula, Balsamic Syrup and Brussel Sprouts, made with Fried Brussels, Sweet Soy, Pickled Carrots. Chef Kevin Laut of Outrigger Pizza Company is featuring crowd-favorite Lilikoi Pork Pizza, made with a garlic aioli base, kalua pork, Maui sweet onions, sweet bell peppers, mozzarella cheese, and topped with lilikoi syrup, and Margherita Pizza, with homemade red sauce, fresh mozzarella, Romano cheese, Parmesan, Italian basil and cherry tomatoes. and White Cheddar Mushroom Pizza with a garlic aioli base, mozzarella cheese, white cheddar cheese, mushrooms, topped with truffle salt. Wine selections are provided by Southern Glazer’s Wine & Spirits, Chambers & Chambers Wine Merchants, Johnson Brothers, and Paradise Beverages. Local beers made by Maui Brewing Company. Besides these wonderful treats, guests will enjoy live music from Maui’s Shea Derrick and Full Flavor, and beautiful ocean sunset views. Fun, unique dinner events will be featured in the live auction. Visit our website for tickets. Grow Some Good’s Taste of School Gardens is an amazing event thanks to our wonderful sponsors! Thank you to the many individuals and businesses that are donating their time, talent and resources to our event this year! New Chefs participating this year include Chef Peleg Miron of Spago, Chef Zach Sato of The Restaurant at Hotel Wailea, Chefs Jaron Blosser, Cody Christopher and Travis Morrin of Three’s Bar & Grill and Fork & Salad, Owner Nicol Bradley of Ono Gelato Creamery and Shack Café, and Chef John Cadman, maker of Pono Pies. Many longtime supporters from some of Maui’s finest establishments join the event again, including Chef Craig Dryhurst of DUO at Four Seasons Resort Maui at Wailea, Chef Roger Stettler with Cow Pig Bun, and Chef Kevin Laut of Outrigger Pizza Company. Thank you for sharing your talent and resources to make this the best school-garden-to-table event on Maui! Wine selections are provided by Southern Glazer’s Wine & Spirits, Chambers & Chambers Wine Merchants, Johnson Brothers, and Paradise Beverages. Local beers made by Maui Brewing Company. Thank you for adding some special cheer to the event! This wonderful venue with a beautiful view gets rave reviews every time. Thank you to the Hotel Wailea for hosting us again this year. We also rely on another Wailea neighbor, the Four Seasons Resort, for providing planning and logistical support. Thank you for helping with the details! We are grateful for our media sponsors, Maui No Ka Oi Magazine, and MauiTime, who are helping us spread the word about Taste of School Gardens. With their help, we anticipate another sold-out event this year! A very special mahalo to Epic Lighting for helping us create a gorgeous ambiance after the sun sets. This is our fourth year working with this top-notch company – Hawaii’s first and only green business certified, 100% eco-friendly lighting company. Local Harvest has volunteered their services in a big way – they are coordinating all of the produce donated from local Maui farmers and bringing it together in time for the chefs to prepare for Saturday night. Mahalo for sharing your time and expertise in sourcing local produce for this event. Taste of School Gardens is Grow Some Good’s premier fundraising event. Our programs are hands-on, outdoor learning experiences that cultivate curiosity about natural life cycles, connect students to their food sources, and inspire better nutrition choices. In addition to helping establish food gardens and living science labs in local schools, we provide resources and curriculum support through community partnerships in agriculture, science, food education and nutrition. Your support helps make this happen. Mahalo! … And every wonderful teacher, parent, volunteer and local business that digs in to help school gardens on Maui thrive!